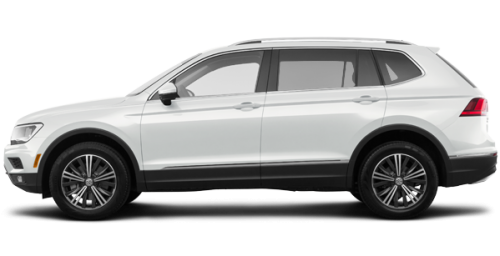 Home > Special Offers > Sales > Get the 2018 Tiguan Today! Get the 2018 Tiguan Today! Lease a 2018 Volkswagen Tiguan Trendline 2.0T FWD starting from $77 weekly at 2.99% for 60 months with $2,550 down! Offer ends on October 31st, 2018. 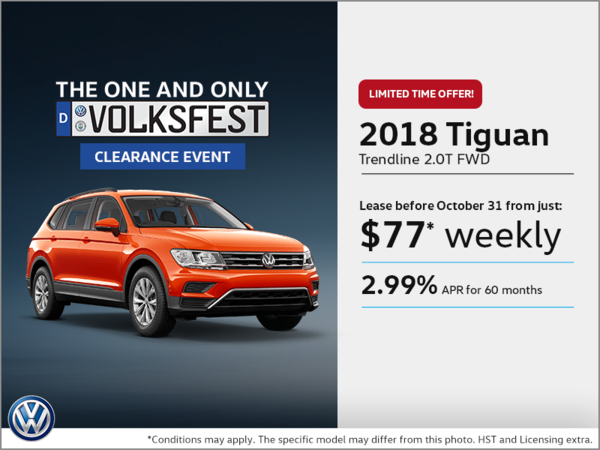 Limited time lease offer available through Volkswagen Finance, on approved credit, based on a new and unregistered 2018 Tiguan 2.0T Trendline FWD base model with 8-speed automatic transmission. $1,845 freight and PDI included in weekly payment. 60-month term at 2.99% APR with weekly payments of $77. $2,550 down payment, $350 security deposit, $22 EHF (tires), $100 air-conditioning levy, $10 OMVIC fee, $58 PPSA fee and up to $499 dealer administrative fee and first weekly payment due at lease inception. Total lease obligation: $23,154. 80,000-kilometre allowance; charge of $0.15/km for excess kilometres. License, insurance, registration, options and applicable taxes are extra. Dealer may sell or lease for less. Dealer order/trade may be necessary. Offers end October 31, 2018 and are subject to change or cancellation without notice. Vehicle may not be exactly as shown. Visit your Volkswagen dealer for details.